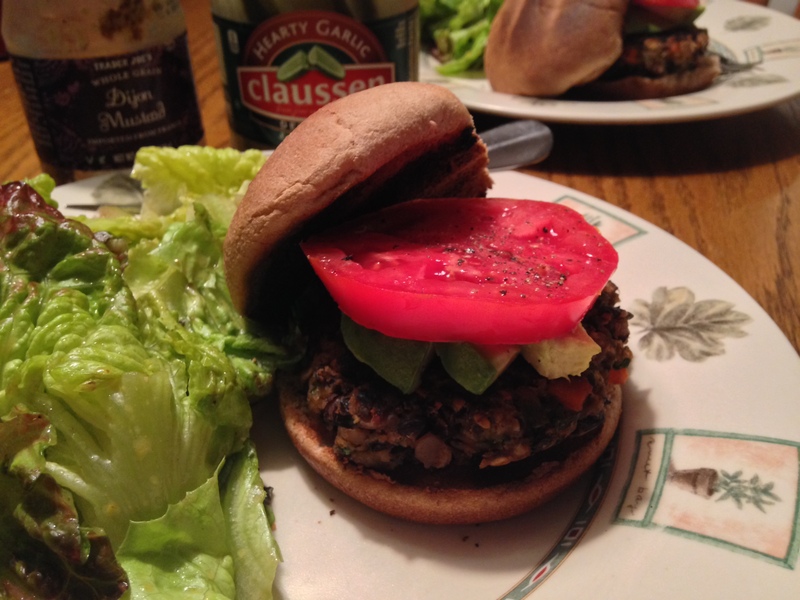 The quest for vegetarian/vegan (V) burgers continues. These burgers were eaten at my friend’s cousin’s wedding shower and the flavors were awesome. I am simply naming these burgers after her. The original recipe came from “Smells Like Home”. I made some adjustments to the recipe to make them gluten free, but they are not vegan because of the eggs. Instead of panko bread crumbs, I used quick minute oatmeal. This is a truly versatile burger. Enjoy! In a sauté pan, with 2 teaspoons of olive oil, over medium high heat toast the oatmeal until lightly browned. Set aside. 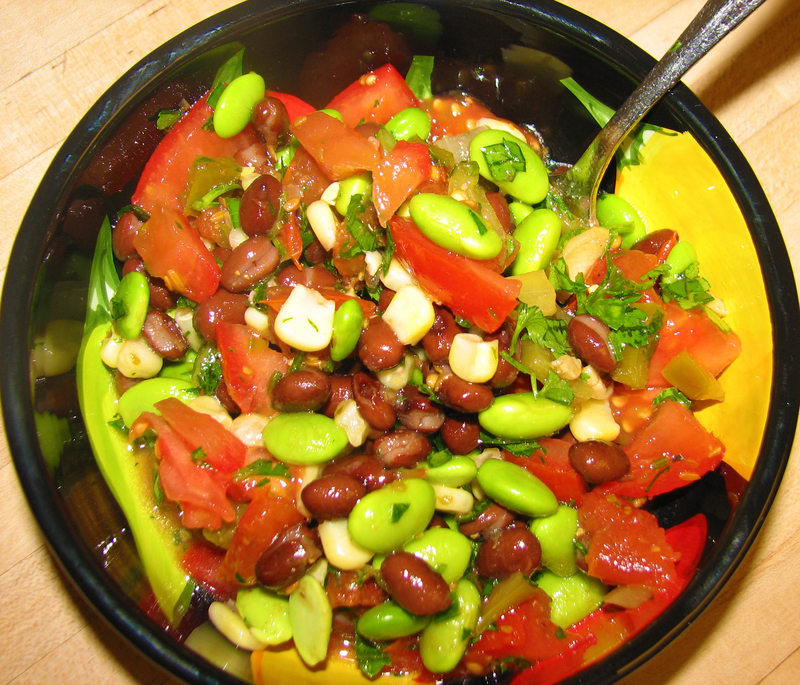 In a large bowl, use a fork to mash 2-1/2 cups of black beans. Add the eggs, cumin cayenne pepper, carrot, cilantro, the remaining black beans, and browned oatmeal, mix well. Chill the mixture in the refrigerator for 30 minutes. This will help form the patties. Divide the mixture into 6 equal parts and shape into patties. Place the patties on wax or parchment paper covered tray and chill again for 10 minutes. Cover patties with plastic wrap if chilling longer for 10 minutes. In the same pan that was used to toast the oatmeal, add 2 tablespoons of olive oil and cook 3 of the patties over medium heat until browned and cooked through (about 5 minutes on each side). Cook the remaining 3 patties with another 2 tablespoons of olive oil. Serve with your favorite burger toppings. I made this recipe from a book called “The Big Book of Vegeterian” because I had bought a lot of sweet potatoes that were on sale from the market. When I was diagnosed with Type II Diabetes, sweet potatoes is one of the vegetables that is low on the Glycemic Index that does not make the glucose (sugar) levels spike. This recipe turned out to be one of my favorite things to make all the time. I demonstrated this in 3 of my diabetes workshops and the feedback from the people were all positive. When I have leftovers, I make breakfast wraps with multi-grain wraps, scrambled egg substitute and 1 oz of cheese. Wonderful alternative for breakfast. Enjoy! In a large cast-iron skillet over medium-high heat, warm the oil. Add the onions and bell pepper and cook, stirring often, until beginning to brown, about 4 minutes. 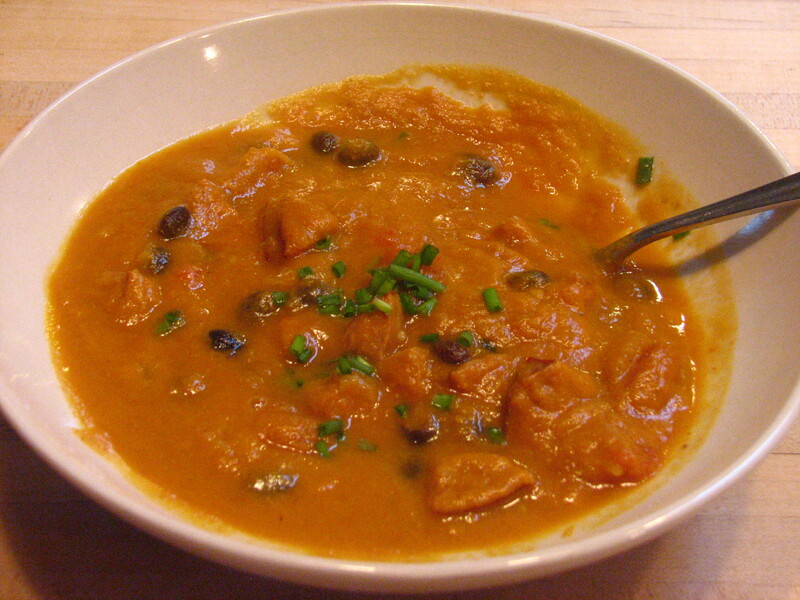 Add the sweet potato and cook, stirring often, until beginning to brown, takes about 5 minutes. Add the garlic, cumin, chili powder and salt and cook stirring for 30 seconds. Add broth and cook until almost all absorbed about 5 minutes. Stir in the corn and black beans and cook, stirring until fully heated through. Stir in the cilantro and season to taste with pepper. 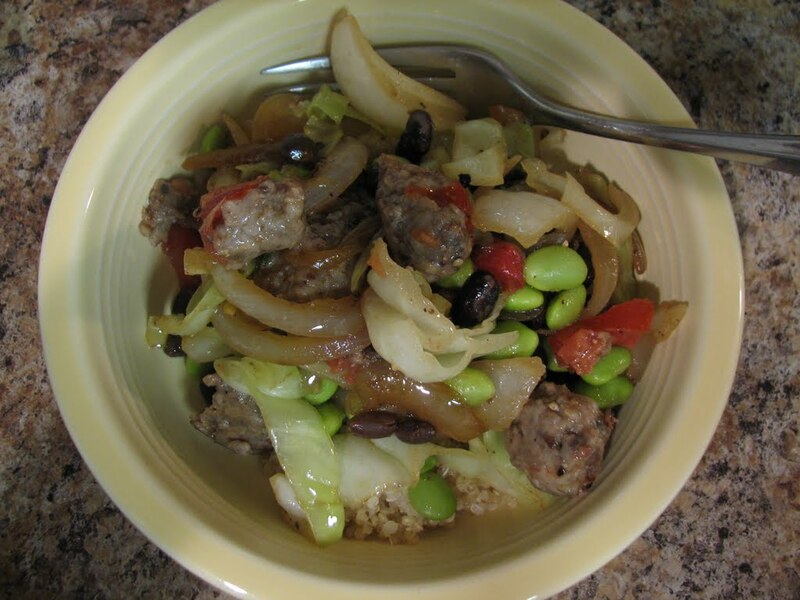 I created this recipe today as a backup plan. I had intended to make black bean plantain burritos but the plantains needed to be ripe and the store only had green ones. I decided to make Quesadillas of some kind but not knowing what. I wandered the grocery store trying to decide. I picked up some 2% Monterey Jack cheese, mozzarella cheese, onions, baby Bella mushrooms and flour tortillas and all of a sudden an idea formed. Slice a medium onion in half and then slice into half moon slices. In a sauté pan, with olive oil, add the onions. The onions need to be cooked for about 15 to 20 minutes until caramelized golden brown color. Add the sliced mushrooms and cook for about 5 minutes until semi-soft. Add the black beans and cumin. Cook until beans are thoroughly heated and remove pan from the heat. 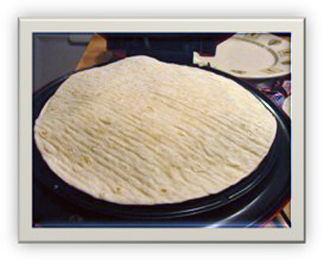 I have a quesadilla machine so I am able to make quesadillas with ease. If you do not have one a 10” skillet warmed will work just fine. Just need to put a plate on top of the quesadilla so that the cheese will melt evenly. Make sure the quesadilla machine is hot. 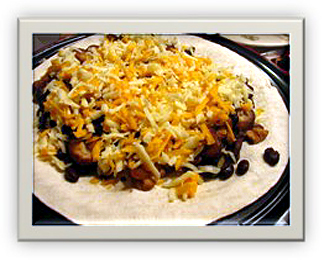 Assemble the quesadilla as follows – flour tortilla, caramelized onion, mushroom and black bean filling, sprinkle with cheese mixture and another flour tortilla on top. Close the top of the quesadilla machine and cook for about 3 to 5 minutes. 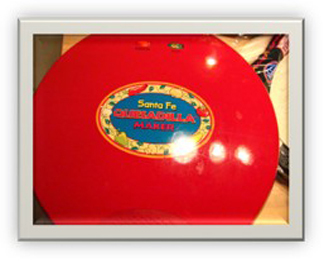 The cheese will melt and the flour tortillas will have a tan color. 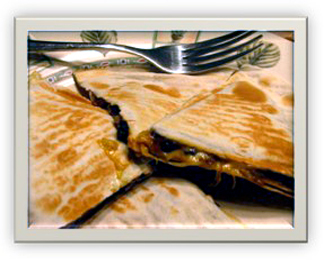 Remove from the quesadilla machine and cut with a sharp knife into 6 – 8 wedges.